Maisie Dobbs—psychologist, investigator, and "one of the great fictional heroines, equal parts haunted and haunting" (Parade)—returns in a chilling adventure, the latest chapter in Jacqueline Winspear's bestselling series. Early April 1933. To the costermongers of Covent Garden—sellers of fruit and vegetables on the streets of London—Eddie Pettit was a gentle soul with a near-magical gift for working with horses. When Eddie is killed in a violent accident, the grieving costers are deeply skeptical about the cause of his death. Who would want to kill Eddie—and why? Maisie Dobbs' father, Frankie, had been a costermonger, so she had known the men since childhood. She remembers Eddie fondly and is determined to offer her help. But it soon becomes clear that powerful political and financial forces are equally determined to prevent her from learning the truth behind Eddie's death. Plunging into the investigation, Maisie begins her search for answers on the working-class streets of Lambeth where Eddie had lived and where she had grown up. The inquiry quickly leads her to a callous press baron; a has-been politician named Winston Churchill, lingering in the hinterlands of power; and, most surprisingly, to Douglas Partridge, the husband of her dearest friend, Priscilla. As Maisie uncovers lies and manipulation on a national scale, she must decide whether to risk it all to see justice done. 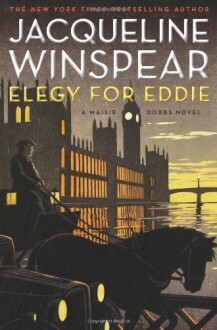 The story of a London affected by the march to another war years before the first shot is fired and of an innocent victim caught in the crossfire, Elegy for Eddie is Jacqueline Winspear's most poignant and powerful novel yet. Another winner in the Maisie Dobbs series. This installment spends more time having Maisie examine her motives and path in life, and the mystery starts the series heading toward the threat of World War II in Europe. I always enjoy these stories and am looking forward to the next one. Maisie Dobbs is now in my mystery series of choice. can't wait to get my hands on the other books! Sadly, not my favorite Maisie.